Jump Ring Problems. What to Do about Them. Jump ring problems are soooo frustrating! Jump rings open when they shouldn't. They don't close properly. And sometimes they just look, well, wrong. Not round and pretty at all. Jump rings are important to just about every jewelry project. If you are going to make jewelry, then you are going to use jump rings! Using jump rings can take a little practice. Sort of like making pancakes. It is a technique you can master. 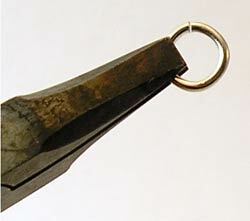 Many newbies to jewelry making find that they have problems with jump rings. They start to wonder, "why me?" as their jump rings look funny and just don't perform their best. Fortunately these can be easily corrected. Jump Ring Problem #1 Your jump ring wire is just too darn thin. When your jump ring keeps coming open on your project it can be really frustrating. Sometimes the problem is that your jump rings are too thin. Look at the wire and decide if you need to use a thicker jump ring. If your jump ring is too soft, then you need to condition the rings to harden them. Your jump ring must be hard enough to withstand the impact of your project (earrings, bracelet, necklace, etc.) or your project simply will not work. To condition your rings, open and close them 6 - 10 times with your pliers. Jump Ring Problem #3: There is a gap in your jump ring. Sometimes you know you've closed your jump ring properly but you still get a gap. This can happen sometimes. It is just the nature of jump rings and you haven't done anything wrong. Remember that wire tends to be "springy" and that it just doesn't like to move exactly where you want it. To solve this, you'll want to wiggle the jump ring back and forth, opening and closing it, until you hear the sweet sound of a "click" as it moves perfectly into place. 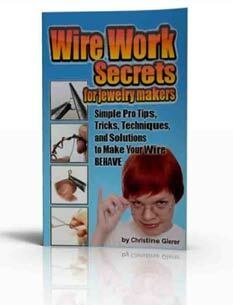 For tons more tips, tricks, and techniques related to wire working and jump rings you might like to check out my eco-friendly e-book, Wire Work Secrets for Jewelry Makers.